This auction is for 1 - 1.5oz Nature's Treat. 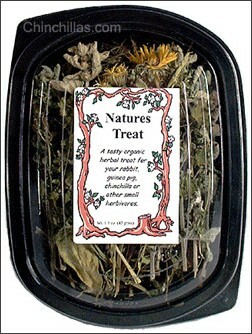 Oxbow's Nature's Treat is a bundle of herbs and is a tasty, healthy treat for rabbits, guinea pigs, chinchillas, prairie dogs and other small animals. It is organically grown, hand-picked and naturally air dried to retain the highest aroma and flavor possible. Each package will vary in the type and stage of herb maturity depending on seasonal differences during harvest. Flavorful herbs encourage animals who are recovering from surgery and illness to eat. These are culinary herbs and can also be added to your own favorite cooking dishes for a flavorful zip! Feeding Directions: Give your pet a couple pieces of Nature's Treat a day as a healthy, high fiber treat. You can also sprinkle on pellets or hay to stimulate there appetite. As with any treat, be careful not to overfeed. Treats should be given as a reward and be a minor part of your pet's daily food intake. Includes 4 or more of the following: Sage, oregano, sweet basil, lemon basil, purple basil, chamomile lemon balm, thyme, peppermint, spearmint, orange mint, horehound, hyssop, catnip, salad burnet, anise, tarragon.